» Who are you going to call? This paper draws upon a research paper prepared for the Australian Communications Consumer Action Network (ACCAN). The focus of this paper is on the best way to provide every adult with universally available, accessible, affordable and empowering communications. Special attention is given to affordability, leading to a litmus test of an affordable broadband tariff. The paper proposes two options for delivering universal service objectives in future. One does not require any carrier to be nominated as the universal retail service provider. The other extends Telstra?s current obligations. Empowering (content/apps) such as government providing free access to e-services. Availability has been the main focus of policy and it may be solved soon with the execution of the national broadband network (NBN). 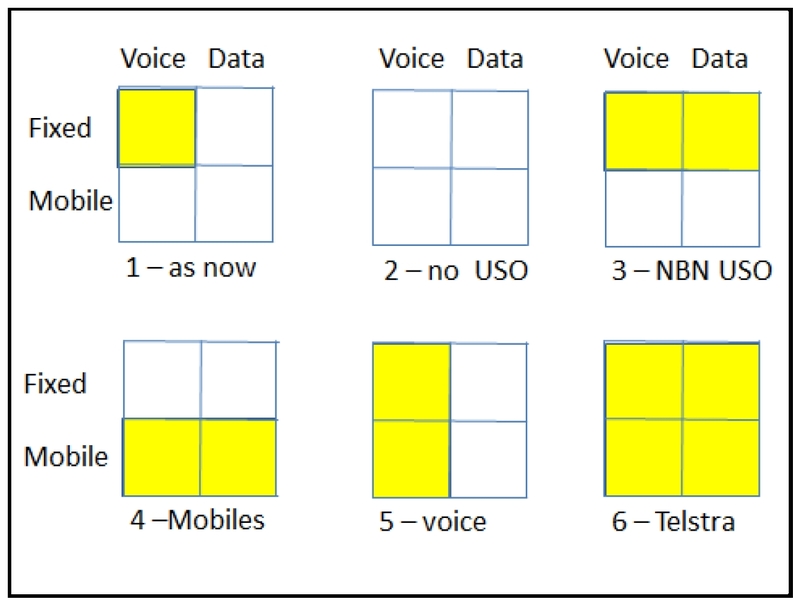 However, given consumer preference for mobiles, a key question for USO policy is how far mobile coverage overlaps the NBN?s footprints, because mobile voice and data could become the preferred platform for users seeking service. Also, the NBN does not solve for the other objectives above. Other policy instruments apart from the roll-out of the NBN are needed. Affordability has not received enough attention and so it is the longest section in this paper. The market for affordability support could be up to one million households; around half the households who rely on government pensions or allowances as their main source of income. Mobile voice and data is not considered a problem for affordability at this time. Competition has ensured that cheap and affordable mobile services are available. The paper considers what fixed network pricing could be considered affordable[ii]. It proposes that large carriers could be required to offer a broadband social tariff which is no more than, say, 0.6% of median[iii] disposable income. The cheapest retail plans for a basic broadband service on the NBN are three times higher than what we need to overcome low income affordability. Four options for making affordable broadband (social) tariffs available to those in most need are discussed. The first is to piggy-back existing benefits. Another is to focus on social housing. The third is to impose a social tariff obligation on carriers. And the fourth is to fix NBN wholesale prices; which are part of the affordability problem now. The paper suggests that the universal principles of availability, accessibility and affordability are not enough to satisfy the aspirations of universal service policy. They are essentially about carriage issues. Content, or increasing the utility of the networks for social inclusion, is important too. Access to e-government could be facilitated with a government portal app that provides free access to government services and the Emergency+ app should be pre-loaded on all smartphones. But, we have to avoid over-reach. Many useful content and applications services will become available without policy intervention. Finally, the paper tests six options for realising these four policy objectives. There are two compelling options. The first is not to nominate any default retail USO provider (Option 2). This would require only the extension of existing codes and standards by the ACMA to reflect the new fixed broadband, mobile voice and data environment. The other option is to extend Telstra?s USO obligations into mobiles and data while giving it freedom to choose delivery options (Option 6). This would be easier to implement without leading to extra costs. It is considered the safe option. With the NBN, improved mobile networks and the migration to all-digital services, it is time to revise USO policy. Much of the focus of government funding has been on improving the availability of rural communications (Table 1). $250m ($50m pa for five years from 1997-98). Source: Author from government sites. The coverage of the NBN?s fixed network will be 93% of premises, which is less than Telstra?s copper network. The May 2010 NBN Implementation Study (McKinsey & KPMG 2010) found that ?99.75 percent of all premises are capable of receiving voice over Telstra?s copper network, with low latency and high availability providing a high quality of service? (p319) while ?A number of premises that today receive copper-based voice services will, however, be unable to receive mobile voice services?. This is why Telstra has a contract to maintain and operate that part of its network which falls outside the NBN?s fixed footprint until 2032. The mid-term review should consider what happens to any remaining customers after that time. Given consumer preference for mobiles, a key question is how far mobile coverage overlaps the NBN?s footprints; including the remains of the copper network that Telstra has been contracted to maintain and operate. The December 2013 Broadband Availability and Quality Report (Australian Government 2013) found that ?Approximately 8.8 million premises (81 per cent) have access to 3G mobile broadband services and about 6.4 million premises (59 per cent) have access to 4G services.? However, that estimate was based on October 2013 data; before Telstra announced it would extend its 4G coverage to 95% of the population and before the nearly $400m Mobile Blackspots Programme was announced in June 2015 covering an extra 150,000 sq. km (Australian Government 2015b). The last 7% of customers who cannot be served by the fixed network will have access to the NBN?s fixed wireless or satellite network. At the inception of the NBN, it was planned to make it a monopoly so that it could cross-subsidise the high cost services with a geographically uniform tariff. But, there will be infrastructure competition for the NBN and the current study (Australian Government 2015a) by the Bureau of Communications Research (BCR) is looking into funding options for the NBN non-commercial fixed wireless and satellite networks (e.g. a USO levy). Affordability is one of the three cornerstone principles of universal service and the one least well served by current USO policy. In Table 2 below, just $40m p.a. is Commonwealth funding of affordability (the telephone allowance). As noted earlier (Table 1), the main focus of policy has been on availability. 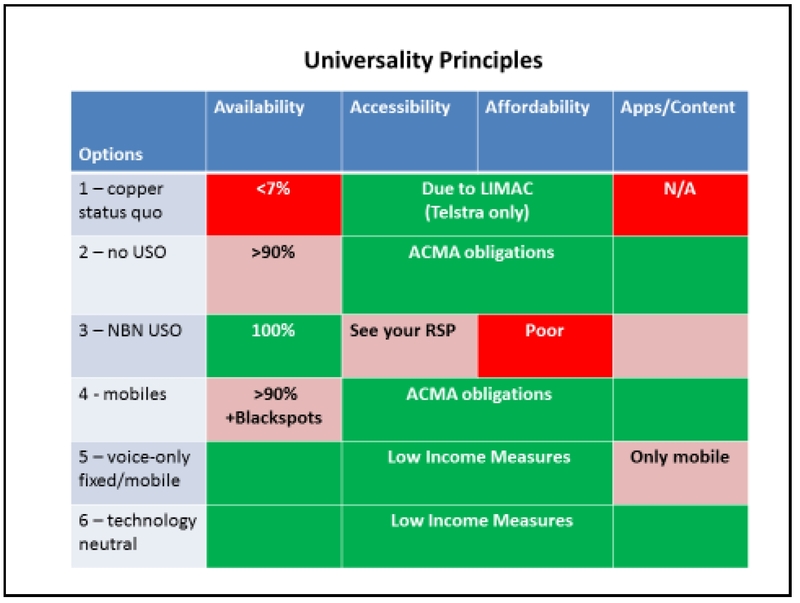 In Australia affordability has not been addressed through the USO but through carrier licence conditions on Telstra; and implemented through low income measures (LIMAC)[iv]. The retail price caps which had applied to Telstra have been removed as part of deregulation. Access for Everyone meets licensing conditions with solutions endorsed by the Low-income Measures Assessment Committee (LIMAC). Sources: Hawkin and Pavlidis (2015), author (objectives) and sites as linked. What do we mean by affordable? Ofcom considers that a ?service is considered to be affordable for a consumer if the consumer is able to purchase it without suffering undue hardship? (Ofcom 2014a; 2014b; 2014c). This echoes another definition of affordability as ?a consumer?s ability to pay for and use telecommunications without sacrificing expenditure on other essential services and items? (Lewin & Milne 2010; p4-5). This has become even more critical with the Government?s Digital First Strategy which says that ?A more digital, networked economy is about far more than broadband. It is about tumultuous change in workplaces. . . . It?s about expanding options and opportunities for individuals, whether as consumers, workers or entrepreneurs?. The corollary is that those without access will be deprived of these opportunities. How big is the addressable market for affordability support? One view is given below. Table 3 ? Disadvantaged Customer Segments in 2010 The customer segments shown already receive various forms of support, so some of these are likely to need support for affordable telecommunications. Note that the table shows only those for whom the pension or allowance is the ?main source? 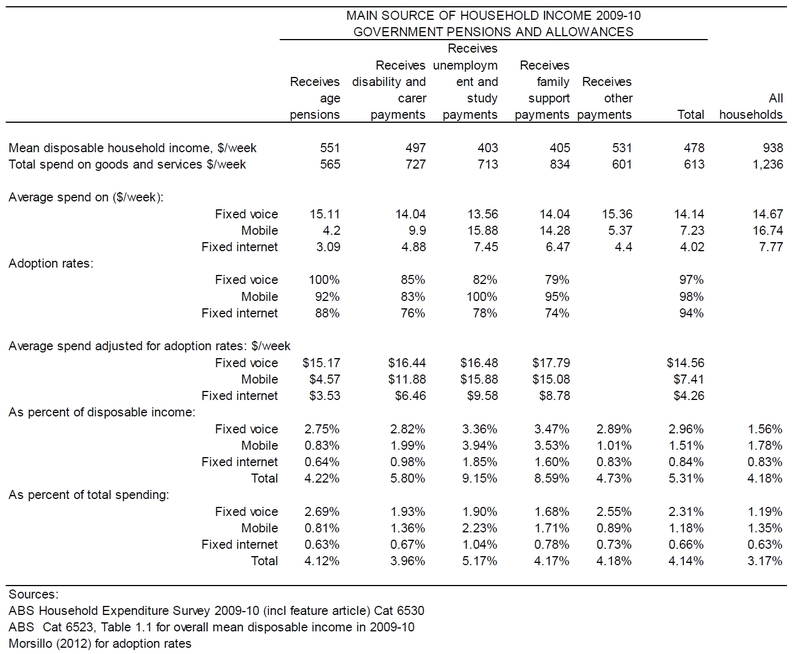 of household income ? there are many more age pensions than shown above. Note also that some households may receive more than one type of allowance (e.g. the total number of households where government pensions and allowances are the main source of income is 2.12 million; not 2.93 million, the sum across the row). Another view of the market for affordability support is derived from what the Australian Bureau of Statistics (ABS) calls the relative poverty line: ?Many developed countries use relative poverty to measure the economic wellbeing of households. These measures identify the proportion of people with an income below a certain fraction of median equivalised disposable household income (EDHI)? [v] (ABS Cat. 6523). There is no general agreement on where to draw the line on relative poverty. The OECD publishes various analyses based on 40%, 50% or 60% of median incomes (50% used most often), while Eurostat commonly uses 60% as the cut-off. Figure 1shows the relative poverty line. At 60% [50%] of the median income, the relative poverty line in Australia in 2013-14 was $506 [$422] per week. At 60% [50%], at least three [two] of the customer segments in Table 3 (median is always less than mean) and up to four million people and up to one million households are below the relative poverty line (Table 4). What can over two million low-income people afford? Can we set quantitative affordability targets? Defining affordability for a minimum level of service requires identifying a threshold above which a household?s ability to pay for the service is compromised. Thresholds based on the share of income or expenditure is recognised as one way of analysing affordability (UK Regulators Network 2015). The threshold can be set as a ?social tariff? ; a price determined for low income customers. It may be offered voluntarily by service providers as an entry-level tariff or they may be required to offer such tariffs ? as argued below. The following table shows what our target segments spent on three main groups of communications services. The household expenditure survey averages spending by item over all households; whether they bought the item or not. The table uses some adoption rates to exclude people not using the service and then looks at the resulting shares of disposable income and total spending on goods and services[vi]. To set an affordable social tariff, we need to know what measure of income or expenditure will be measured against the target percentage for affordability. It needs to be easily obtainable and current. For now, let?s use median disposable income (EDHI) which in 2013-14 was $844[vii]. In August 2015, the cheapest retail NBN plans for Telstra, Optus, TPG and iiNet averaged $69 pm; which includes line rental but not calls. That?s $17.25/week and 2.0% of median and EDHI. It is up to twice as much as what the customer segments in Table 5 were paying for fixed internet. It is not getting any better. The ACCC (2015a) reports that NBN retail prices increased 4.6% in real terms (about 7.6% nominal) in 2013-14; the only telecommunications service whose prices increased in the year. This is not helping to achieve affordability. A social tariff for affordable fixed broadband at around $5/week or 0.6% of median EDHI in 2013-14 is needed. The problem with making a social tariff available to, say, those who receive age pensions is that they are not all needy. Tables 3 and 5 included only those whose main source of income was government pensions/allowances. But, that is an ABS construct; not an administrative construct. Tying rights to social tariffs (or vouchers) to existing pensions and allowance regimes may be problematic. Another approach is targeting, say, those in social housing. A local example of assistance targeted to users in social housing is that provided by infoxchange in Melbourne. In Australia, there are over 300,000 households in social housing (ABS Cat 4102). A third approach is to mandate social tariffs. These could be imposed by the ACMA either through changes to the Telecommunications Consumer Protections Code, or carrier licence conditions[viii] or, more likely, through Determinations issued through Section 2 of the Telecommunications Act 1997[ix]. The Determinations approach has been used to require proof of identity to be supplied before supplying pre-paid carriage service number, and to require an informed decision from residential fixed-line telephone customers on NBN Co fibre to the premises infrastructure regarding their backup power supply (backup battery) requirements and to keep appropriate records for a specified period. Work also needs to be done on what accessibility (including performance and reliability standards) requirements may need to be addressed through codes in a fixed broadband and mobile voice and data context. A fourth approach changes NBN wholesale pricing to help achieve affordability. Currently, the minimum wholesale cost on the NBN is $24 pm (for 12/1 Mbps) (NBN Co 2015); which is a high place to start from for affordable retail pricing. As illustrated in Figure 2, a ?Traffic? 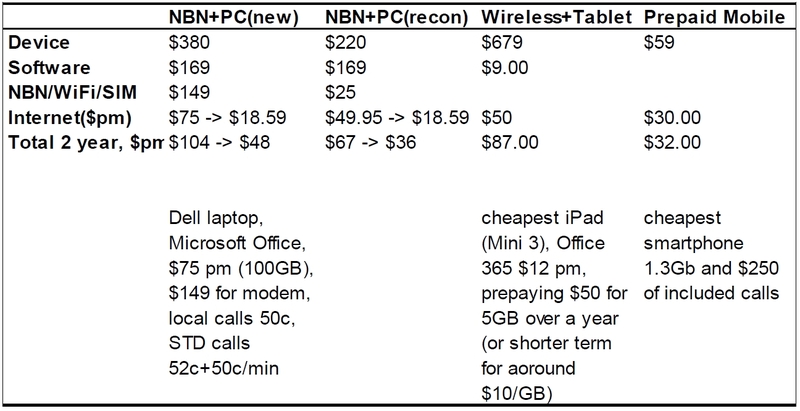 pricing model (De Ridder & James 2014) would allow the NBN to cut the current minimum cost by more than a half, leading to affordable retail pricing. The estimated retail price for the entry level plan is below the $5/week target suggested earlier. The scheme administers itself because only low data usage users will take an entry level plan and their service provider will shift the wholesale tariff to the standard tariff when usage grows beyond the breakeven point ? and, hopefully, move the user to a new retail plan too. Morsillo (2012) estimated the total cost of ownership of internet access for low income households. The wholesale traffic pricing proposal above would make a significant difference, as shown in Table 6. 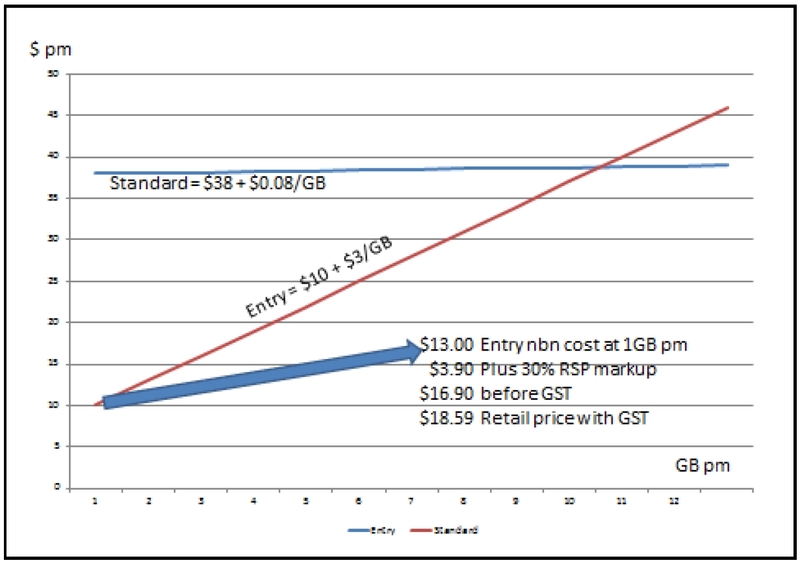 The revised prices are based on only 1GB per month of data with Telstra. This would be sufficient to support an affordable voice service, but the 1GB might need to be supported by unmetered access to on-line government services to fulfil the empowerment objective. Also, work needs to be done on how to structure social tariffs, because the regressive nature of communications spend discussed earlier is exacerbated by the ?poverty premium? (Ofcom 2014a; 2014b; 2014c; SACOSS 2015) which arises through the way low income consumers pay for services; in particular pay-as-you-go for mobile phones or paying for their communications service by non-direct debit payment methods (where a payment surcharge may apply). The universal service obligation falls on one or more retail service providers ? who are you going to call? The NBN has a wholesale service obligation. But it is not enough on its own ? retail service providers are not obliged to use NBN networks. There are six broad USO policy options. All have to be supplemented with affordability and accessibility initiatives for both broadband and mobiles. One of the three dimensions that differentiates the six options is voice versus broadband (includes voice and data). The second dimension is the technology platform; fixed versus mobile (plus fixed wireless and satellite components of the NBN on which up to 7% of customers will have to rely). But the third dimension needs to be added. As described in Figure 3 above, the options are only ?supply-side?. They address only availability, noting geographical constraints posed by different platforms. We also need to address the ?demand side?, which in USO terms means vertical equity[x] leading to accessibility and affordability. Figure 4 below above maps the six options against horizontal and vertical equity for voice only (left hand of chart) as well as voice plus data (right hand side of chart). The third dimension is represented by the vertical axis ? the higher the better. Option 3 is shown at the lowest point on this axis because it does least in terms of affordability and accessibility; as will be discussed further below. However, this option has the widest spread on availability (horizontal axis) because it includes fixed-wireless and satellite. Going up the vertical axis, the reason for the question mark just above Option 1 (voice-only) is that we do not know the extent to which improved mobile coverage may make Option 1 redundant. Option 4 (mobile voice and data) has been placed above Options 1 and 3 because mobiles are generally considered to be more affordable than fixed services. Prepaid is part of that outcome but more could be done to make mobiles more affordable. Option 2 (no USO) is included with Option 4 as it is argued below that mobiles competition, supplemented with obligations to address accessibility and affordability, would not require nominating a universal service provider. Option 6 (Telstra) is based on nominating Telstra as the universal service provider. It sits higher than Option 3 because it also addresses accessibility and affordability goals. And it is above Options 2 and 4 because of availability (fixed wireless and satellite). 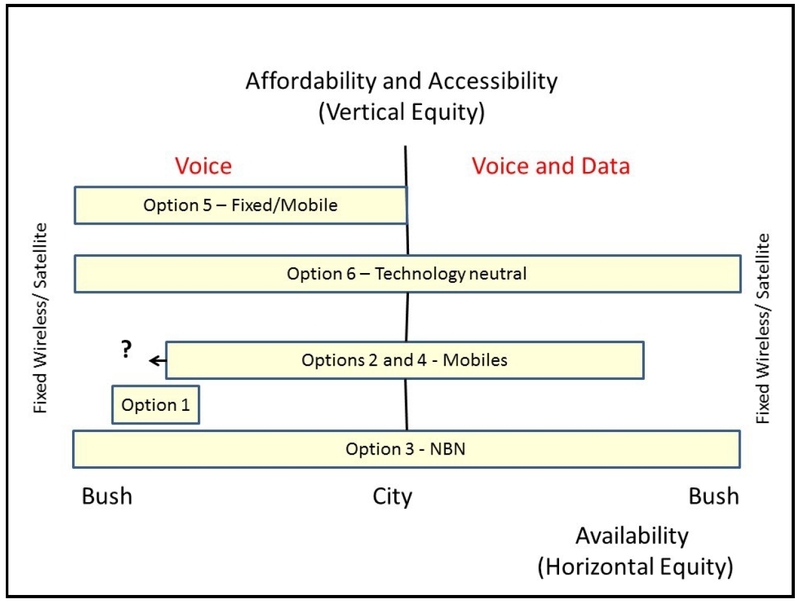 Option 5 (voice-only across fixed and mobile) is high on the vertical equity scale because Telstra has developed a suite of ?Access for Everyone? (Telstra nd) measures with the Low Income Measures Assessment Committee (LIMAC) to improve affordability and accessibility for fixed voice services. Option 1: Voice-only on the fixed copper network. Telstra has a contract with TUSMA[xi] to continue providing the USO over copper in areas not served by NBN?s fixed network. Telstra has also been deemed the default voice-only provider on the NBN (Option 3). Option 2: The benchmark option, positing no USO obligation (apart from the contract referred to in the previous option). What would happen? Without a default universal service provider, it is likely that mobiles competition could largely satisfy the universal service principles of availability, accessibility, affordability and empowerment. The market will provide, helped by ongoing programmes like Mobile Blackspots. Of course, mobiles cannot match the 100 percent availability promised with the NBN. Some customers will have to rely on, say, satellite. Under this option, wholesale satellite service costs will be the same as equivalent wholesale metro services with the NBN?s cross-subsidies supported by the funding arrangements currently being considered by the Bureau of Communications Research. But there is no guarantee that satellite customers would be attractive to any retail service provider after taking account of backhaul costs and the costs of meeting any special service or performance standards that may be imposed for such services. Affordability programmes are probably not required. Prepaid mobiles are currently very affordable. This makes Option 2 attractive because nobody has to be nominated as the default retail USO provider. It should not be necessary as the outcomes will look much like what we would expect from Option 4 (mobiles become main delivery platform; but again without any nominated USO provider). Option 3: This delivers a voice-plus-data USO obligation over NBN networks. As discussed earlier, there is bi-partisan support politically to include data in universal service, as demonstrated by the investment in the NBN which is designed to offer both voice and data everywhere. The NBN has been made the default wholesale carrier. Unlike Telstra under the existing USO, the NBN is not also the default retail provider. Initially, Telstra will fulfil the role of retail provider of last resort within the NBN fibre footprint for customers ? but only for voice. This commitment applies as a contractual obligation to TUSMA. This seems like a temporary measure and ignores data (but see Option 6). Telstra?s voice-only USO role is unlikely to be contested by other fixed providers. That is because, to date, the NBN has not shown much imagination in helping to make access affordable for a basic telephone service. The minimum wholesale price is $24 pm compared with the $16 pm that Telstra is currently charging for unbundled local loop in metro areas. Competition for voice-only service will come from mobiles. It is unlikely that there would be more competition for voice (or voice and data) services in rural and remote areas even though the geographically uniform $24 NBN tariff is about half the unbundled local loop service price for the copper network in rural remote areas. If you want a broadband service over the NBN, ?who are you going to call?? The obvious default retail provider is Telstra, which should not require a subsidy if (and only if) the NBN maintains geographically uniform wholesale tariffs; which is what the BCR study is seeking to support. An important related point is that network separation could make some customers un-commercial for Telstra. On the copper network, any customer that covers their directly attributable costs is commercial because that customer then makes a contribution to overheads including the cost of the network. But, with the NBN, what were overheads become directly attributable costs for Telstra[xii]. The NBN refers customers to their retail service provider for accessibility issues and does not provide apps or content. But, what the NBN can and should do is to provide wholesale pricing to support retail providers and low income customers. Finally, if the NBN is privatised, how can we ensure that the Statement of Expectations and other things that the company has agreed to in order to support universal service will survive? Option 4: This switches the delivery of the USO to mobile networks. The first era of broadband was ?always on?. In the next era it will be broadband that is ?always with you?. This option does not entail making mobile carriers universal service providers. Competition will drive coverage (aided by continuing support for Mobile Blackspots) and affordability. With respect to coverage, it is possible that mobile coverage is better than voice provided over copper services. The December 2013 Broadband Availability and Quality Report says that only 0.318m of the 1.4m most poorly served fixed service customers (categories D and E) have access to 3G or 4G; at October 2013 ? over 1 million customers rely on copper for voice services. How much has that changed? With respect to affordability, Telstra is not the cheapest provider in the market, but the Freedom Plus plan in the pre-paid mobile column of Table 6 is 0.9% of median EDHI; less than what disadvantaged segments were paying according to Table 5. What about untimed local calls? Calls from mobiles are national. The fact that they are all timed is not an issue for current mobile users whose calls are short relative to fixed voice calls. The May 2010 NBN Implementation Study suggests (p321) providing a ?home-zone? in which a voice service could be provided over a mobile network with untimed local calls offered within a zone corresponding to the user?s premises. That may be considered inadequate as the Extended Zones that apply to country areas are very large. But, if voice in future is carried as data, timed calls become redundant as data is not timed. It may be necessary to set standards for the quality of voice calls or ensure other aspects of service to support the four pillars of universal service policy. As noted earlier, the ACMA has powers to achieve this. This approach has a number of attractions. First, any requirements would apply to several retail service providers. Second, it would promote a contestable market. Third, where it is not contestable (due, say, to lack of coverage), there is a natural default provider in Telstra. Fourth, the infrastructure is privately funded (with some direct subsidies for extending coverage). Option 5: This would confine the USO to voice, as now, but include mobile networks. It is difficult to see what would be gained by this option. As noted with Option 1, a voice-only USO is no longer socially or politically acceptable. All the other options include both voice and data. Option 6: A safe, technology-neutral option, broadening the USO to include data, and made available across both fixed and mobile networks. Telstra could be nominated as the universal service provider for both voice and data. Technological neutrality would then mean Telstra would not be constrained to use the NBN if a more efficient alternative is available. This is the ?safe? option, as Telstra is already a proven universal service provider ticking all the boxes (availability/accessibility/affordability) with respect to voice services. It is easy to see Telstra?s obligations extended to data; which would need the LIMAC safeguards adjusted accordingly. This should also include replacing the current definition of standard telephone service with another definition consistent with voice over broadband. Unless Telstra had to price its social tariff below the floor set by NBN wholesale prices, there should be no need to revisit subsidy arrangements with Telstra (the current TUSMA contract for voice over copper would continue). However, if the NBN de-averaged wholesale prices so that prices in the bush are higher, Telstra would be disadvantaged if retail service pricing continues to be uniform geographically. This is because other retail service providers would not have to serve the bush. It would be better that NBN pricing remains geographically uniform and is supported by the arrangements that the Bureau of Communications Research is to recommend shortly. The six options are tested against the universality principles in Figure 5. Option 3 (NBN) is the best in terms of availability alone but relies on retail service providers for two of the four universality principles and is not helping them at all with affordability. Whatever the RSPs do with the NBN is covered in options 2 and 6. Option 1 is temporary and limited to voice. So, that can be dismissed along with Option 5 which is also voice only. Option 2 (no USO) seems very attractive and is similar in terms of outcomes to Options 4 (mobiles) and 6 (Telstra) because it would probably be driven by mobiles. In Options 2 and 4 no formal designation of any carrier(s) as the universal service provider(s) is required. The desired outcomes could be achieved through obligations on accessibility and affordability imposed by the ACMA under the Telecommunications Act. ACCAN. (2010) Our Broadband Future ? What Consumers Want. Hawkins, W.; Pavlidis, K. 2015 "Affordability and 21st century telecommunications services", Australian Journal of Telecommunications and the Digital Economy, Vol.3 No. 2. McKinsey; KPMG. 2010. NBN Implementation Study. Morsillo, R. 2012. ?Broadband affordability in Australia: Looking beyond availability?. Telecommunications Journal of Australia, Vol. 62, No 5. Pavlidis, K.; Gadir, J. 2013. "Improving affordability of communications". Australian Journal of Telecommunications and the Digital Economy, Vol 1, No 1, Article 10. See http://doi.org/10.7790. [i] Note that traditionally the USO was about providing affordable service to every household. But, now communications are personal because of mobiles; hence adult rather than household. [ii] This supposes that providing vouchers or increasing government allowances would be politically unacceptable. [iii] The median is a form of average where exactly the same number of people or households fall either side of a certain amount. The mean is the simple average. [iv] See Telstra?s Access for Everyone site for details of its support programmes. Representatives on the LIMAC Committee include the Australian Council of Social Services, the Smith Family, the Saint Vincent de Paul Society, the Salvation Army, Jobs Australia, Homelessness Australia, Anglicare Australia and the Council on the Ageing. [v] Equivalised means standardised for household composition. For example, ?a couple household with one child would need $1,800 weekly disposable income to have the same equivalised disposable household income (EDHI) as a lone person household with a disposable income of $1,000?. 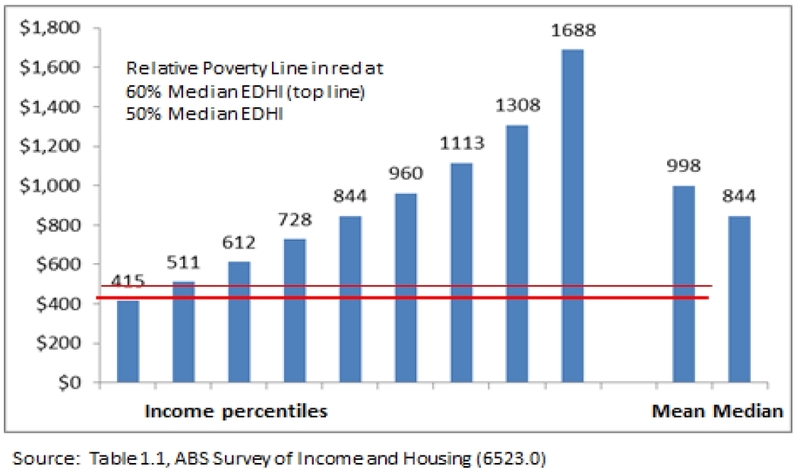 [vi] Although disposable income is less than expenditure, ?The ABS has long advised that some low income households have characteristics that indicate they have a higher standard of living than that implied by their incomes alone? (p12, Cat 6554, October 2011). [vii] ABS Cat 6523, Table 1.1. The ABS updated the mean $938 shown in Table 5 of this paper using CPI. The median is taken from the middle percentile shown in the same table. [viii] Under Division 3, Section 111 of the Radio Communications Act 1992 (https://www.comlaw.gov.au/Details/C2015C00143) the ACMA can make changes to the licence conditions of individual licensees or receive a direction from the Minister through a legislative instrument to make changes. [ix] Schedule 2 of the Act already includes obligations on service providers with respect to operator services, IPND (numbers), directory services and itemised billing. Under section 99 of the Telecommunications Act, the ACMA may make a written determination setting out additional rules that apply to service providers in relation to the supply of specified carriage or content services. [x] Vertigan?s market and regulatory report (Vertigan 2014) termed horizontal equity ? ?ensuring households can access a service on similar terms, regardless of where they are located? and vertical equity as ? ?ensuring that irrespective of income level, all households can afford the service? (p98). [xi] In 2012, the Telecommunications Universal Service Management Agency (TUSMA) became the principal responsible for the USO and entered into contracts with Telstra (Australian Government 2012) to deliver the obligations ($253m p.a. until July 2032). In July 2015, TUSMA was folded into the Department of Communications (Australian Government 2015c). [xii] Ian Martin drew this double marginalisation effect to my attention with his RBS note Telco Services: funding the USO on the NBN (17 June 2011).